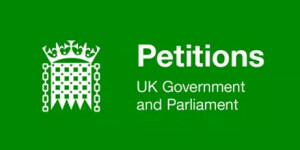 T he petition to oppose all schools being turned into academies has gathered 55,ooo signatures in just over a day! Get everyone you know to sign. This government is dismantling the fabric of our society bit by bit for their own ideological reasons. 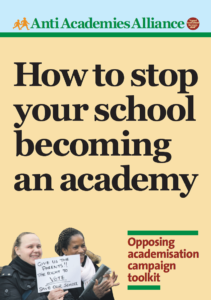 Changing all schools to academy status was not included in their manifesto and they have no mandate for it – just as they had no mandate to make drastic changes to the NHS in their first term of government. What is happening to democracy in our country when this government thinks it can do what whatever it likes without consultation. Schools should remain under the supervision of local councils, who are accountable to the local electorate, not some highly paid faceless administrators. Dismantling the State Education system can never benefit the children in education. This is an act of pure spite and only serves the warped ideology of the Conservative Party; Education and Healthcare for the rich and to hell with the rest of society. Do not privatise our schools. The evidence does not prove that academies improve the quality of education. If the government truly values education, then reduce class sizes, cut the amount of paperwork teachers now have to produce in triplicate and let teachers get on with teaching great lessons and raising standards because they have more time to spend with their pupils. Do not privatise our schools. 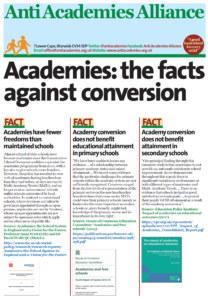 The evidence does not prove that academies improve the quality of education. If the government truly values education, then reduce class sizes, cut the amount of paperwork teachers now have to produce in triplicate and let teachers get on with teaching great lessons and rIsing standards because they have more time to spend with their pupils. It is difficult to understand how a government with such a narrow mandate feels empowered to privatise education in such a high handed way. Kent County Council is Tory but the leader does not agree with this policy and I take my lead from him. this is a mad policy whih must be stopped in its tracks. this is ideologically driven and scary.stop it as soon as possible. 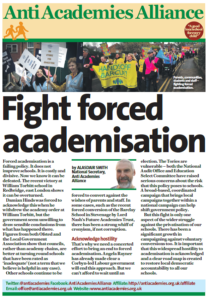 Local democracy and local authorities are an integral part of a national education system and should not be excluded to be replaced by private firms. The Government says Academisation will give more power to Headteachers. For Primary Heads in MATs and MACs the opposite is true. There will be less money available to us, more meetings to attend and no power in decision-making as only two Heads from all the schools in the MAT /MAC are allowed to be on the Board. This is not the way to go. I strongly believe that schools should be funded by and accountable to local authorities and should not be owned and run by trusts and the private sector. These plans will not improve the quality of British education. Turning schools into academies is not beneficial to students or teachers. I do not agree to this policy. My comment is one of anger and disgust in this government! This an attempt to privatise education, and setting back education a hundred years or more. It is terrifying and we must stop it.